Fate of the Elder Gods on Amazon. 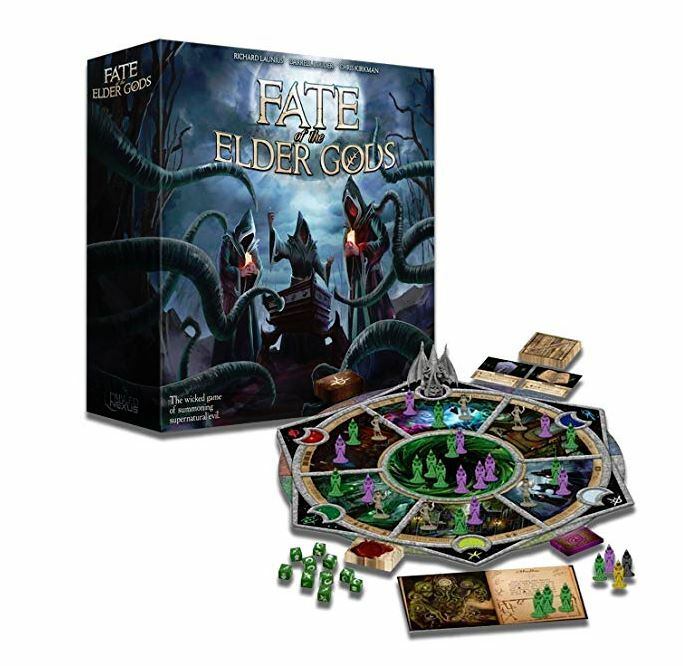 In Fate of the Elder Gods, players take on the roles of the High Priests of cults trying to summon Elder Gods. Doing so requires the sacrifice of a great many cultists, and your nefarious plans are always threatened by investigators trying to seal your gate with Elder Signs. The winner of the game is the first to successfully summon their Elder God. Fate of the Elder Gods was a big hit in our group. It has relatively simple rules, but deep strategy. Fate has a nice collection of mechanics, such as action selection, hand management, asymmetrical powers, a bit of area control and some randomness with a few die rolls to resolve actions. It is also an attractive game, with a great looking board and serviceable miniatures. This is a game that I think will appeal to both Euro and Ameri-Treasure gamers. The core of Fate of The Elder Gods is an “action selection” mechanic. 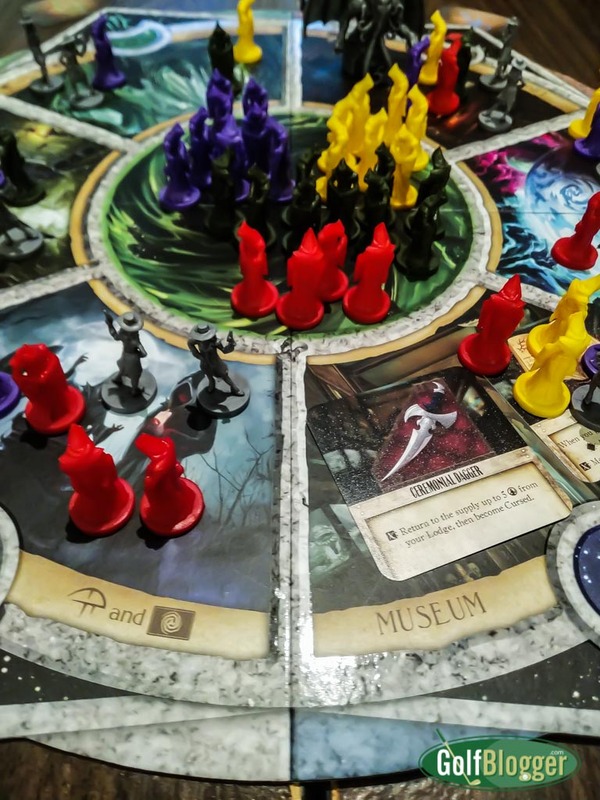 On their turn, players use Spell Cards from their hand to move the Fate Piece (a large Cthulhu model) to the various locations on the circular board. Each of the six locations (the Museum, the Library, The Gathering, The Ceremony, the Streets of Arkham and the Other Worlds) allows the player to perform a specific set of actions to help the Cult advance. The Ceremony, for example, lets a cult activate its’ Elder God power. The Void allows a player to sacrifice cultists to the Void (the center of the board) to advance the Summoning. The Gathering, on the other hand, attracts new Cultists to your lodge. The Library adds Spells to your hand. The Museum is the source of powerful artifacts. The Streets of Arkham initiates a “raid” on another Cultist’s lodge. Visiting a location has two other effects. First, it lets you add a cultist to the board to try to “control” that area and gain bonus actions. But beware, for each time an area is visited, a new investigator is drawn to the area. If three or more investigators are present when you visit an area, they head to your cult’s lodge, where they may well initiate a raid. That’s bad, because in the course of a raid, the investigators are likely to try to close your gate with one or more Elder Signs. If your gate is completely shut down, the game is over, and you lose. At that point, the player with the fewest Elder Signs wins. Managing the meddling investigators adds another layer to the game, and opens an avenue for players who are hopelessly behind in the race to open a gate. If the lagging players can pile up Elder Signs on the leader, they have a path to victory if they have the fewest Elder Signs themselves. The Spell Cards have multiple purposes. The backs have different astral symbols which are used to travel to locations to take actions. Cards used for movement are left on the board at the Fate Piece’s current location (to be used later to prepare spells). We thought of it as expending a particular kind of astral energy at Location A to move to Location B. The fronts of the cards have spells, which for the most part thwart other players’ plans. This often sets up interesting dilemmas. Do you use the card for its movement, or save it because you’d like to cast that spell later? Preparing a spell for casting has a “cost” in astral symbols which is indicated on the spell side of the card. A player can prepare a spell for casting (immediately or at a later time) if the pile of astral symbol cards left behind at that location by player movement matches the cost on the card. It is really very clever. The spell cards can be used for movement, which in turn powers the spell cards. Each of the Cults in the game is devoted to one of eight Elder Gods, each of which has its own powers. The Beasts From Beyond expansion adds more Gods, as well as monsters which can be summoned with spell cards. The different Elder Gods adds quite a bit of replayability. You could play a very large number of games, indeed, before ever coming back to the same combination of Gods ( I *think* that’s 1, 680 combinations for four players). Another point in Fate’s favor is its solo player mode. I played two games solo and had quite a bit of fun. Fate of the Elder Gods has a lot going on in the context of some pretty simple rules. It’s fun.